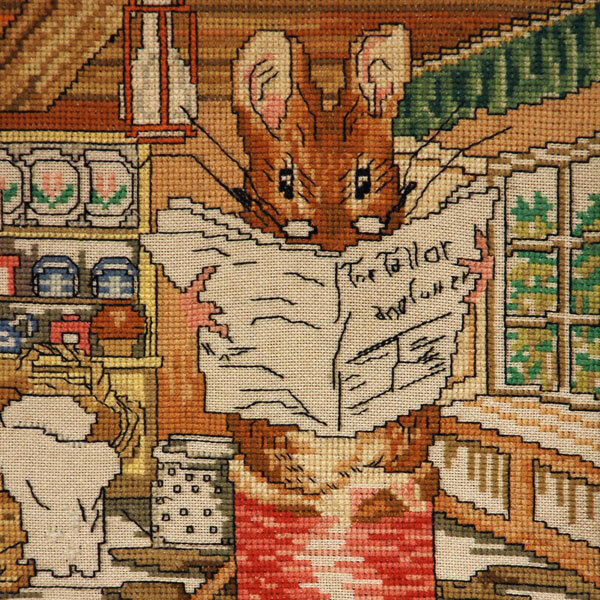 The magic of Beatrix Potter stories leap from this expertly rendered 'counted cross stitch' embroidered tableau as if her characters are speaking to you through the glass covered cotton linen 32" x 15" framed panel. This arresting expression of her work renders individual nuances so detailed that fantasy morphs into reality. The viewer becomes a secret observer in the world of Mr. McGregor's garden, the fly on the wall in Hunca Munca's wood house. 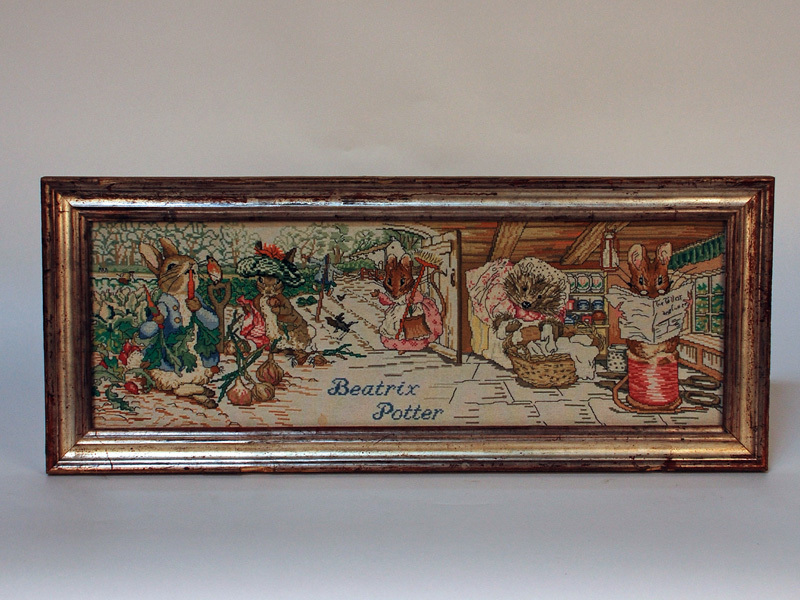 As a young girl, Beatrix smuggled frogs, newts, ferrets and even a pet bat into her rigid Victorian parent's home. 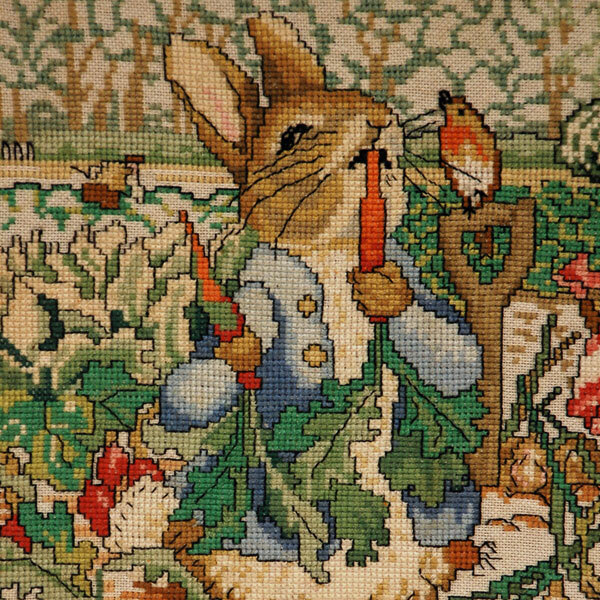 She loved her animals and they became her intimate friends, some of which grace this extraordinary work along with the portrayed rabbits and mice. .
By the 1930's she began devoting her artistic talents to illustrations, the stories you see suggested here. She cherished the flora and fauna of her beloved Scotland and made such closely observed and pianted wartercolors of not only her imaginative tales but also of scientific studies which earned her a solid reputaion in the field of lichens and fungi. Beatrix eventually wrote 23 books before she died in 1943. The quality of her drawings, the animals so full of character, has led to her international fame and to translations of the works throughout the globe. Numerous films and TV adaptations, the latest with Rene Zellweger continually try to capture her spirit. But one only has to savor this lovely work of art to achieve that goal. I acquired this piece in the antique market area of Barrio de Santa Cruz in Seville, Spain a few years ago. We believe it dates from the early 20th century, with silver gilt frame.